UHD is requiring better content protection technologies. Though protecting content in bilions of consumer devices will remain an almost impossible challenge new technologies try to do the best possible. The article in PCworld claims it may be too late for Microsoft top save the PC as playback device. Indeed: they may be right. But Playready also has a huge footprint in the online distribution and streaming space. Microsoft should take that interest seriously or risk loosing UHD there. The slide above clearly show the current trend in new protection architectures with more TEE and hardware technologies replacing software. It will be more difficult to break, but with the added risk that once broken it will be impossible to repair. 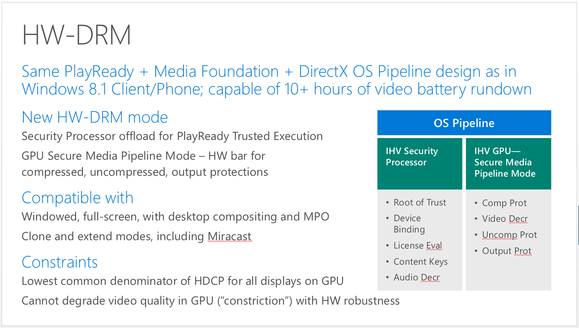 All about PlayReady 3.0, Microsoft’s secret plan to lock down 4K movies to your PC | PCWorld. This entry was posted in Uncategorized by theboss. Bookmark the permalink.